Upsell is a recommended upgrade from the source product (inital one) to a product of higher value. It will replace the existing source product, therefore the impact is higher unit value and thus increasing the revenue. As a company, if we could upsell only the Business Card product by 1% to 3% then we would see a 580K increase in revenue from business card orders for 2018 and an 4 million increase by 2020. 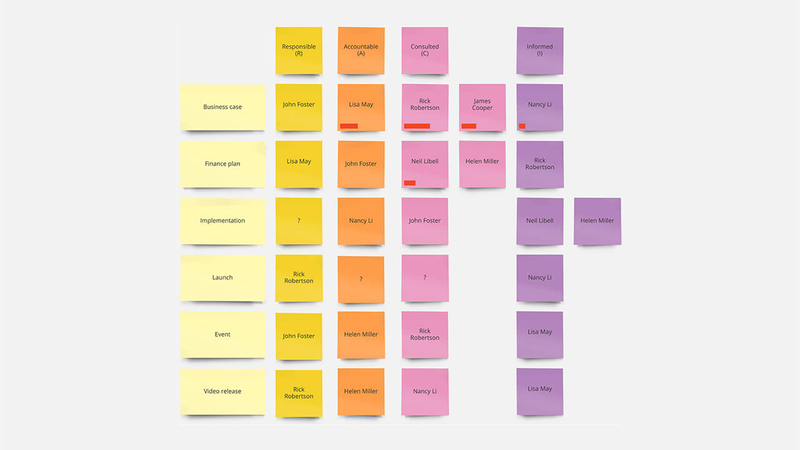 I was tasked to tackle upsell in the part of the Template browse journey and explore how it could fit in the rest of the flow. 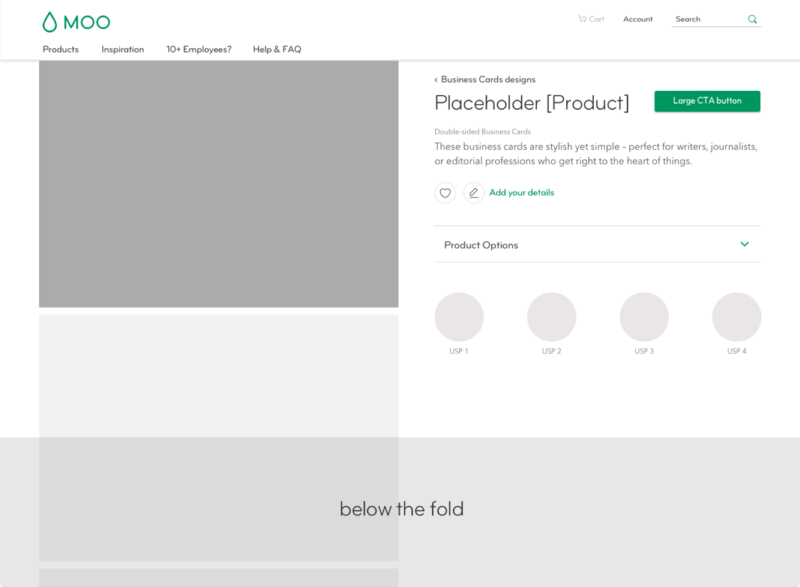 As the Digital Product Designer of the TnT Crew (Templates and Tools) who owns the Template Browse and Product Detail Page experience at MOO, I led the UX strategy, the UX Research and the UI deliverables for the Upsell project. In addition, I worked alongside a Product Manager, a UX Researcher, the crew Tech lead, a Business Analyst, the Director of Marketing and the Director of Product. 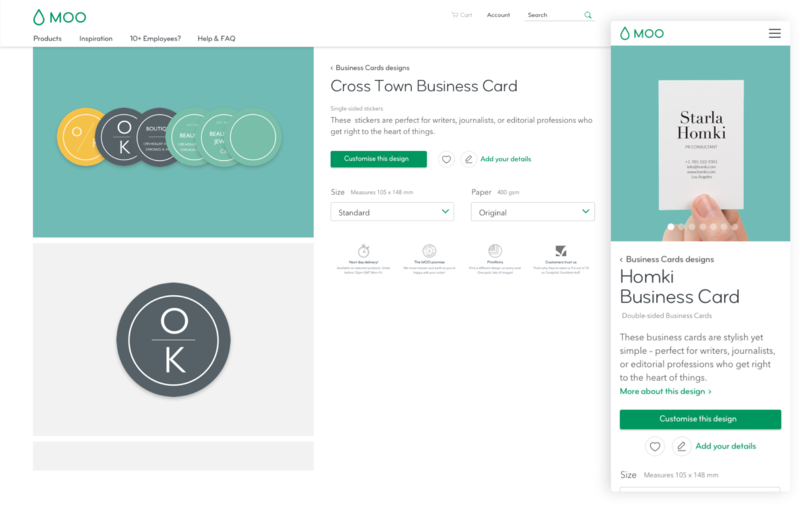 Identify the core segment of MOO customers to focus on for upsell. I first had to understand the problem from the business and user perspective and gather all the informationI needed in order to find the area to focus on. Then, I was able to make informed design decision andcome up with hypotheses and solutions to test and refine. As a last step we were able to size and prioratizethe refined solutions. As this was a big project with a lot of stakeholders involed I wanted to establish a way of communicating our progress and also managing feedback in order to make the process as smooth as possible and also create transparency and trust. Before the kick-off meeting for the Upsell project, I did a RACI - Responsible, Accountable, Consulted and Informed. I facilitated an 1 hour kick-off meeting with key project stakeholders (PM, Tech lead, UX lead, Director of Product, Director of Marketing and Business Analyst) in order to identify the core segment that we would be focusing on for upsell. 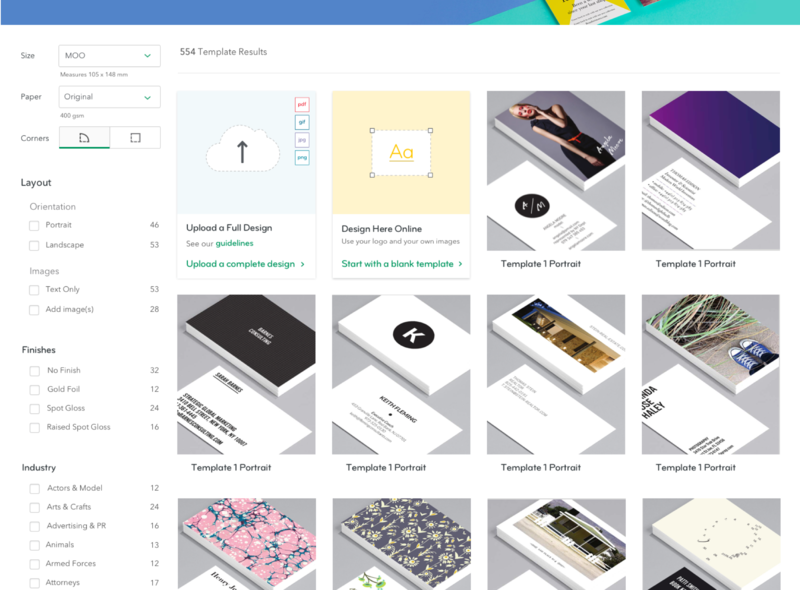 We identified that our Creative Enthousiasts (no design knowledge) customers make up for 45% of our yearly revenue and they use our design templates and online tool to create their print products. Also, it was agreed that upsell should be focused on new customers as return behavior was another project on it’s own and out of scope for this one. After we knew the customer segment, we had to identify the business card product that we wanted our customers to upgrade to. I paired with the product manager and the marketing director to discover which of our higher quality papers were good candidates from a business perspective. 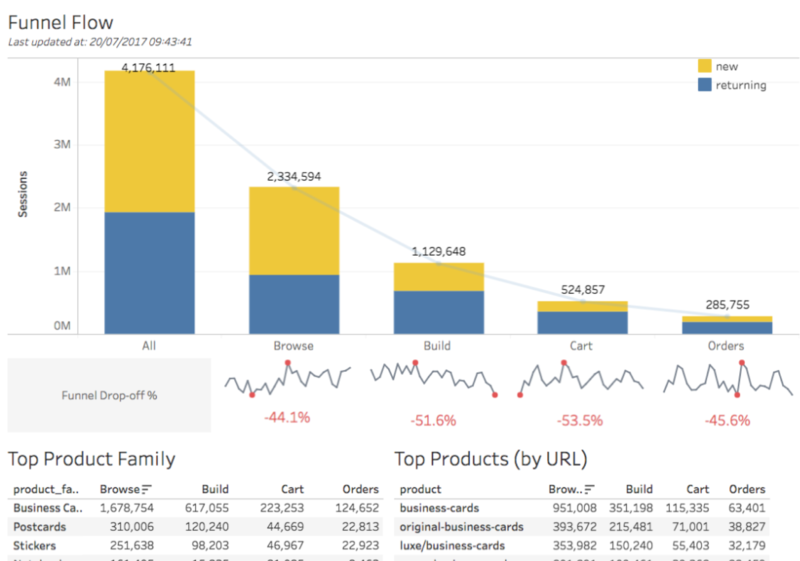 Orders, revenue, reorders, AOV and SEO search terms were the 5 metrics that we looked at. The potential products were Luxe paper stock (thicker) and Super paper stock (special finishes can be applied like gold foil or spot gloss). 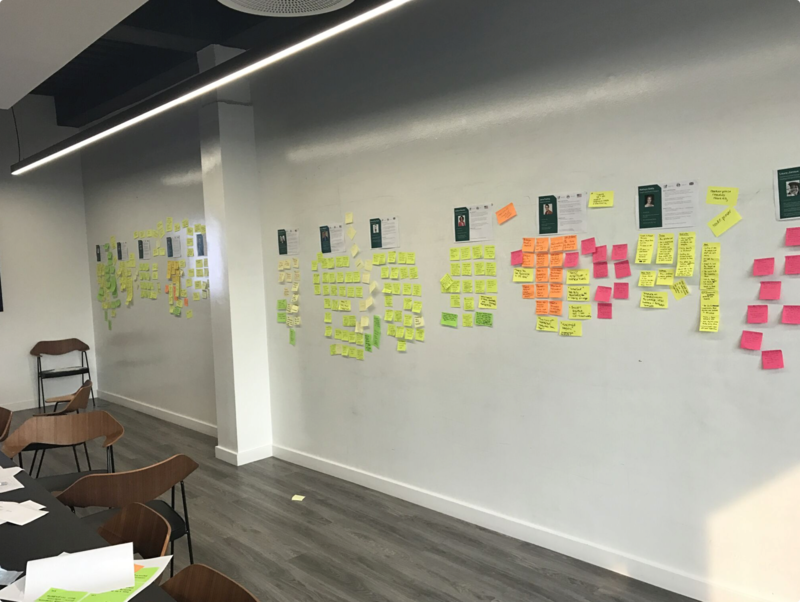 At this point we had a clear understanding of the customer group we wanted to focus on, where in the journey to apply upsell and two product candidates as upgrades. Next, was understanding the problem from a customer standpoint. 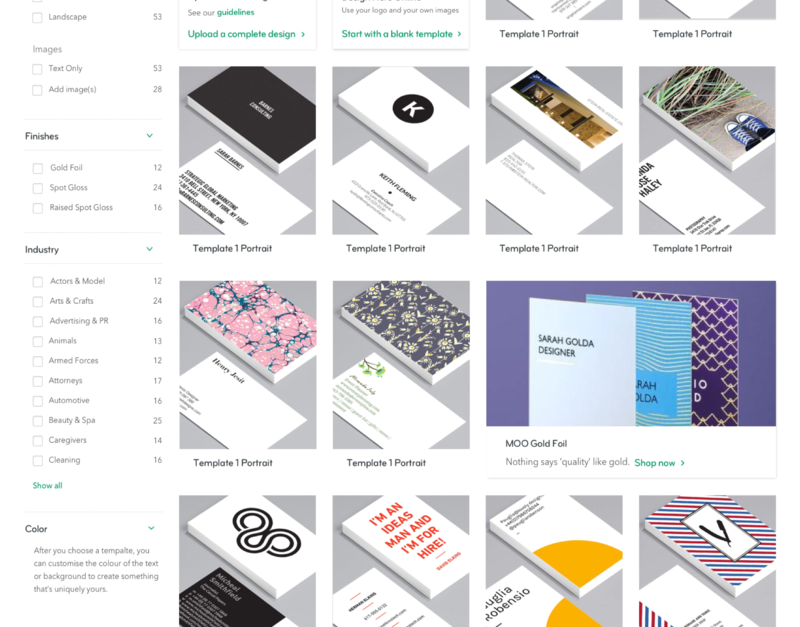 As a first step, I looked at Chattermill for customer insights about paper and quality. 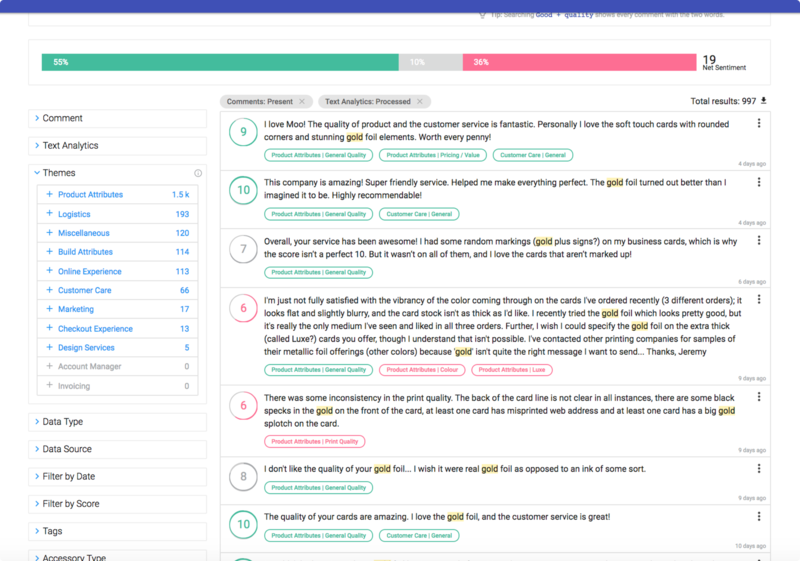 I wanted to understand how MOO customers talked about the 2 papers (Luxe and Super) to our Customer Service team. I looked at a 6 month span of insights. What is the perceived value of the 2 papers for a non MOO customer? What new customers are looking for when shopping for BC for the first time. What would make them upgrade from a lower quality paper to a higher one and what would deter them. I did the synthesis together with the UX Researcher, analysing the findings and patterns and turning them to valuable research insights. Super paper was described as flexible and being able to add flair because of the special finishes. High quality for reasonable price was the #1 reason that would sway customers to upgrade. Customers look for USP’s when searching for the first time, like turn around times, fast delivery and other company features. While doing the synthesis we identified 3 main modes or behaviors that our customers exhibited. At this stage we knew the customer segment we were focusing on and what part of the journey to apply upsell. 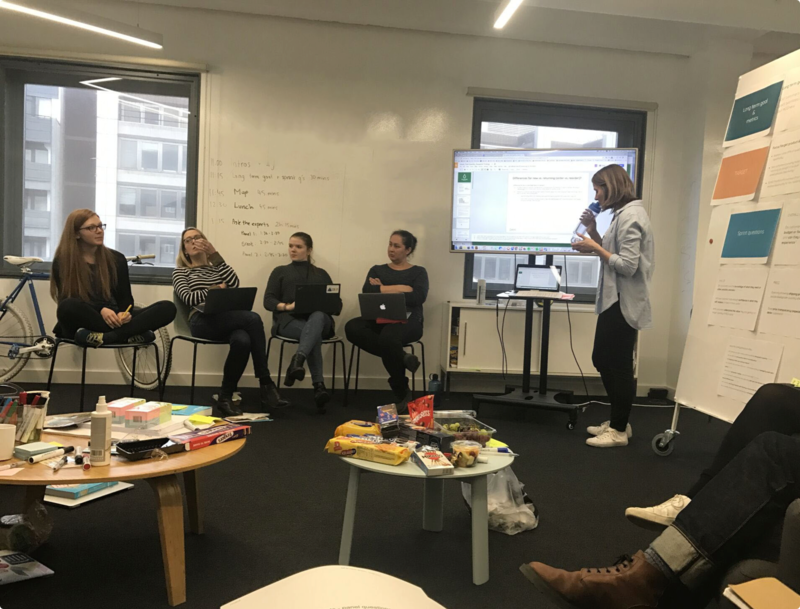 I facilitated a 1-hour session to present back to key stakeholders the quant (Chattermill, Tablaue) and qual (User Research) data so that we can make an informed decision regarding which product to choose as an upsell upgrade. Super Paper (with special finishes e.g Gold Foil) was selected as an upgrade and also to focus on the 2 search modes that customers are likely to get up-sold. 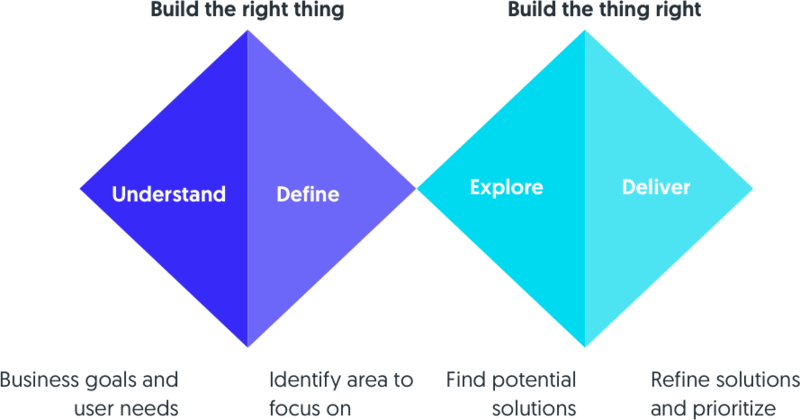 After the Discovery phase, I had all the necessary data to start formulating Hypothesis and Riskiest Assumptions (RAT) on how might entice customers to upsell in the template browse journey based on the 2 modes we agreed on. If we show paper through interactive content (video/animation) then customers would be more likely to understand the physical quality. 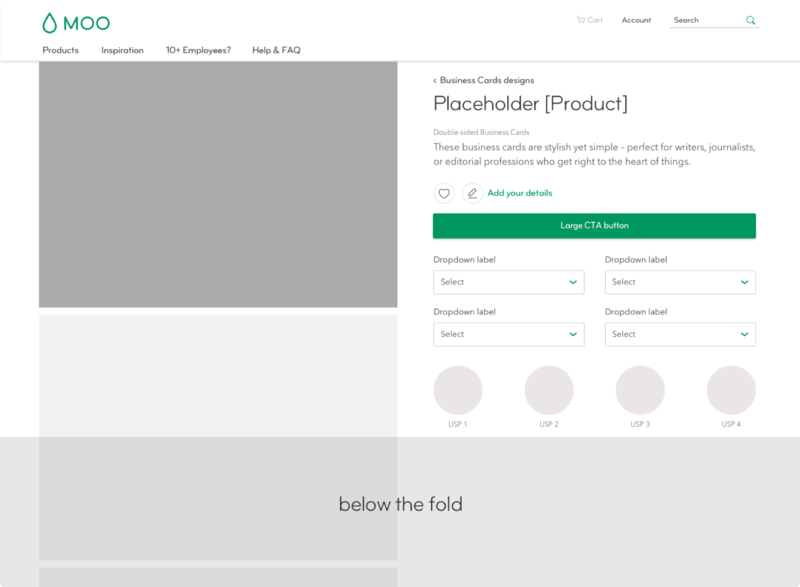 If we display possible paper upgrades in the template browse page then customers would more likely find and convert in a higher quality paper. 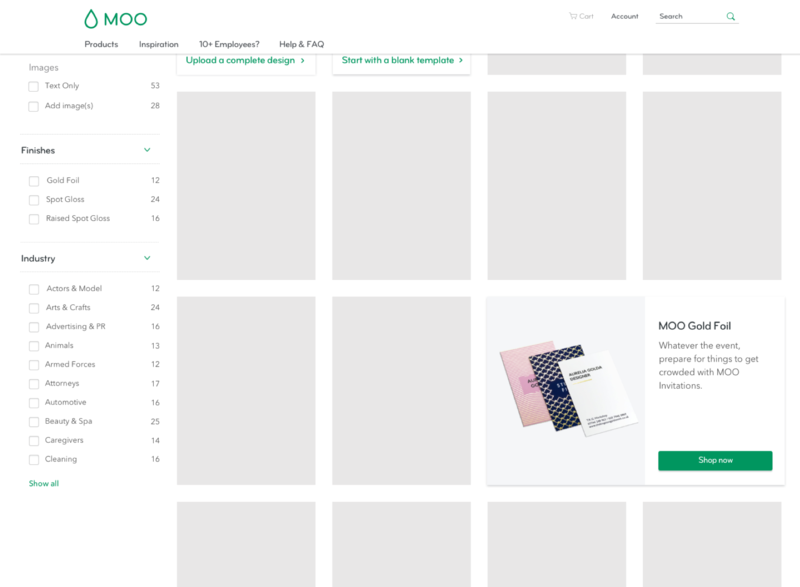 If we focus more clearly on the MOO USP’s in the product details page then customers would be more likely to make an informed decision, convert through to Build and commit to buy. I began to frame the hypotheses into HMW’s and from there, I began sketching ideas on paper and when I had solid concepts I mocked them up in more detail using Sketch. We had concepts with enough detail to be user tested and then refined. 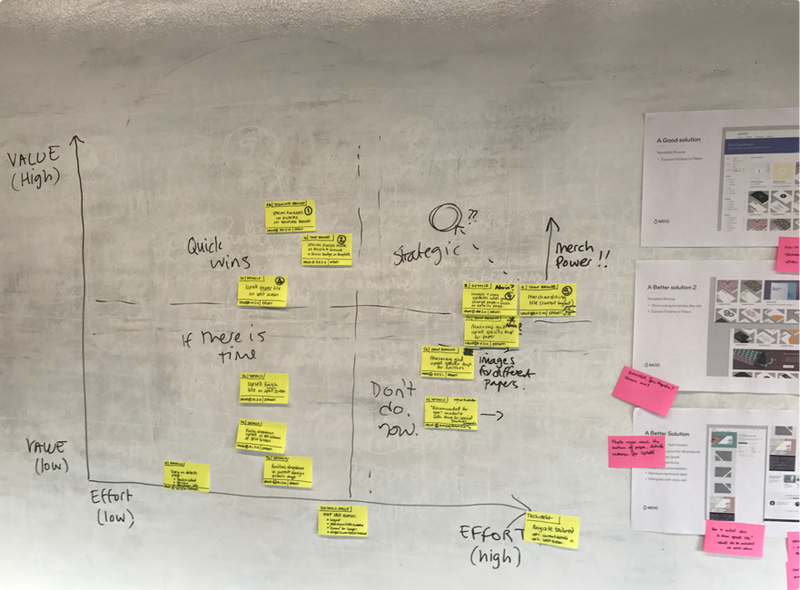 After we refined the solutions we did an effort-value mapping with the core team. We wanted to gauge the effort vs the value of each solution using the RICE technique (Reach, Impact, Confidence, Effort) and then, have a phased approach with experiments to run and tackle upsell. The first experiment that was identified as a quick win, based on RICE and user testing, was to add a new filter for Paper Finishes (e.g Gold Foil finish) in the Template Browse page. 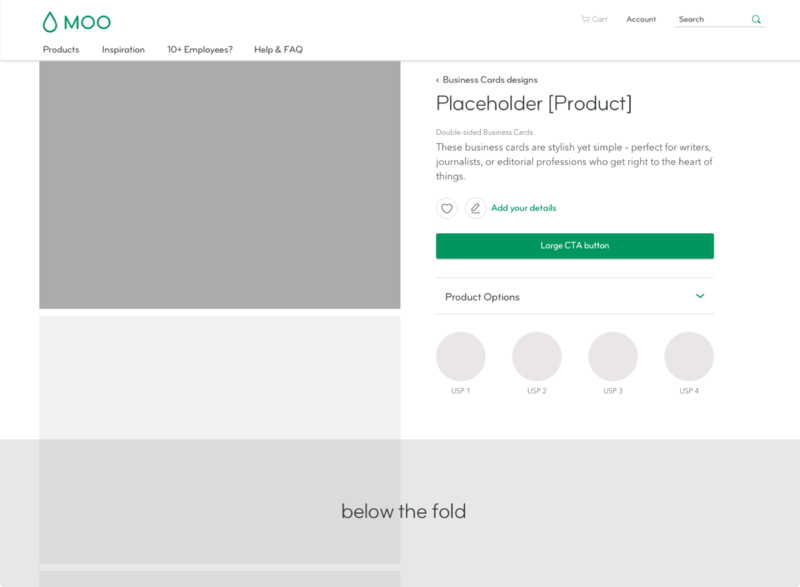 Customers searching MOO templates for inspiration (general expolaraion mode and those with intent) could find a paper upgrade solution much easier by searching for it in the filters. The second experiment we ran, was to add Paper Upgrade Tiles in the Template Browse page. 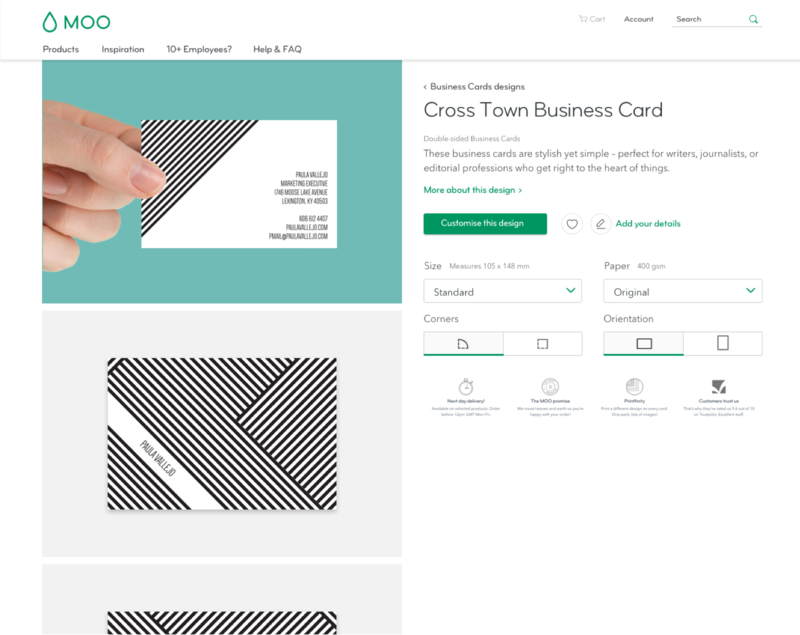 When customers search the MOO templates (general expolaraion mode) they would see a different tile that showcases Super paper with Special finishes like Gold Foil. The goal is to inform and entice the customers to make a paper and finish upgrade. Trade-off: Promotes finishes effectively but some users called out that it looks like a pushed content. This was the most successful from user testing standpoint. The rationale behind rethinking the details page was that the current one has a lot of technical debt which makes it difficult to implement new features like Upsell and also those pages don’t share a unified IA structure. 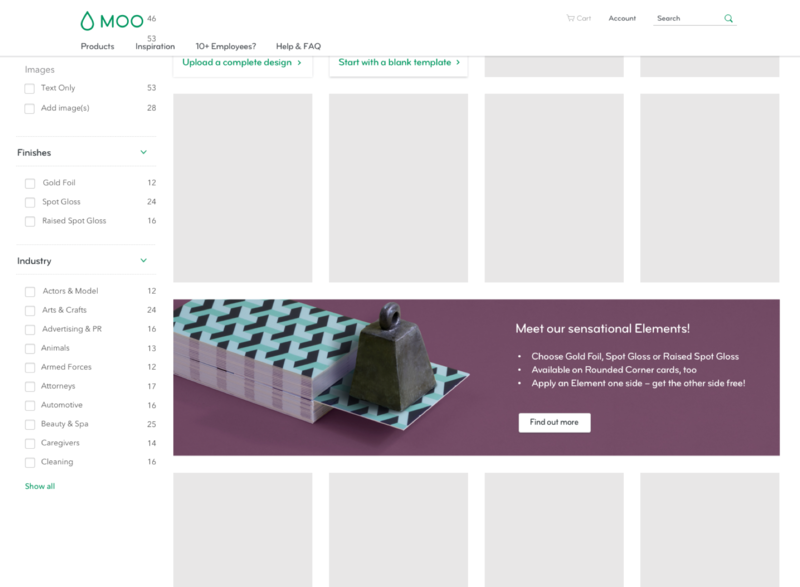 The new design will accommodate all printed products having the same layout and IA, will enhance the focus on MOO USP’s, utilize upsell and remove technical debt. Trade-off: More development work but higher ROI as we can build more features faster having this as a base. The main change was that I shifted the layout from horizontal to vertical and always had in mind how the mobile version would work. Showcasing the unified IA and layout for products - e.g stickers and the mobile version of the product details page. For each test we built the solution and launched it in our biggest market (US Market) so that they could reach the statistical significance and we can get results faster. 27% increase in orders for our Super paper stock business cards orders from customers converting from the details page which translates to £42K in revenue. Re think how to do the RACI. Problem was that Consulted stakeholders didn’t know if they should have only participated when asked or to engage and ensure their perspective is included which created a lot of back and forth. A workshop format might have solved the hazyness around the roles. Select participants from different areas. For the initial customer research we focused on a US only sample - since it’s MOO’s biggest market. However, getting insights from international markets and especially the UK - second largest might have yielded different results and we might had a different angle on tackling upsell. The tests were completed by the end of May 2018. From the numbers we are confident that the 1st A/B test and the 3rd A/B test were the most successful ones. Next step is to rolled out those features in other markets e.g Europe and International and in all locales.